Last weekend, a friend of mine boldly went where many many men have gone before. He turned 30. I suppose it gets us all at some point. As I await my birthday, I know there's no point in hiding, but it's not easy to accept that it may be time to act like a grown-up. 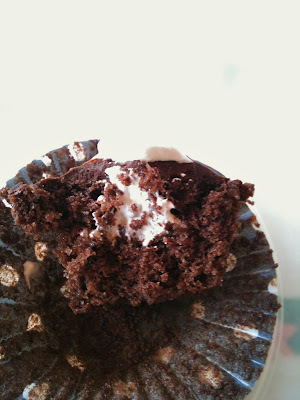 So, instead, let's eat cupcakes reminiscent of childhood! At a bar! Whisk together flour, cocoa, baking soda, baking powder and salt. In a separate bowl, beat butter until smooth and creamy - about 2 minutes. On medium speed, gradually add sugar, beating until light and smooth - about 5 minutes. On low speed, beat in eggs and yolk one at a time, add vanilla. Beat in flour mixture in 4 additions, beating well after each one. Then drizzle in hot water, 2 Tablespoons at a time, until batter is smooth and shiny. Fill cupcake liners no more than half-full. For mini cupcakes, a rounded teaspoon of batter was enough. For regular cupcakes, use 1/4 cup of batter. Bake at 350F / 180 C until a toothpick comes out clean - about 15-20 minutes. I ended up with 36 mini cupcakes and 2 big ones. For the cream filling, I used my recipe for meringue frosting and added butter. Whisk first 5 ingredients together in a stainless steel bowl. Set the bowl in a wide, deep skillet with about an inch of simmering water. Be sure the water level is at least as high as the depth of the egg white in the bowl. Beat egg white mixture on low speed until it reaches 140F/60C. Do no stop beating while the bowl is in the skillet. Beat on high speed for exactly five minutes. Remove bowl from skillet and add vanilla, beating on high speed for two to three more minutes to cool. Beat in butter. Transfer to a pastry bag with a star tip. When cupcakes are cooled, insert tip into the middle of the cupcake, about half-way down and squeeze in cream until cupcake is heavier...stop when (or before) it begins to crack. After filling cupcakes, spread a thin layer of chocolate ganache over the top. Warm cream for about 10 seconds in microwave. Stir in chocolate and let sit 2 minutes. Stir to combine. If necessary, briefly warm in microwave. Spread a thin layer on cupcakes. Actually, I thought the ganache tasted too much like real chocolate for a copycat Hostess cupcake, so I suppose if you're going for authenticity, you should use a ganache recipe that includes butter and vanilla, too.